How true Kate! Thanks for sharing and your artwork is beautiful! Ps I clean before visitors! Life is too short! A very moving post Kate, and so very true!! Your card is a real stunner, I am in love with that background!! The colours are exquisite, the subtle greeny blues off set by the warmer tones, – fabulous!! Your wonderful post reminded me of a quote from one of my favorite Doctor Who episodes Blink. One of the characters, Sally Sparrow, is taking photographs of an old, run down house. Oh Kate, what a beautiful post…both in word and creativity. I was truly moved by your thoughts and I appreciate you being open and candid with us. Your card, once again, is a work of art and loveliness. And what a fabulous find at your Goodwill store. I couldn’t help but smile when you said you’re a tea hoarder. Happy Spring to you! Hugs! Very moving thoughts Kate and so true. Although we do forget some memories I believe that in the oddest of times they come back in a surprising way that triggers them to come forth. 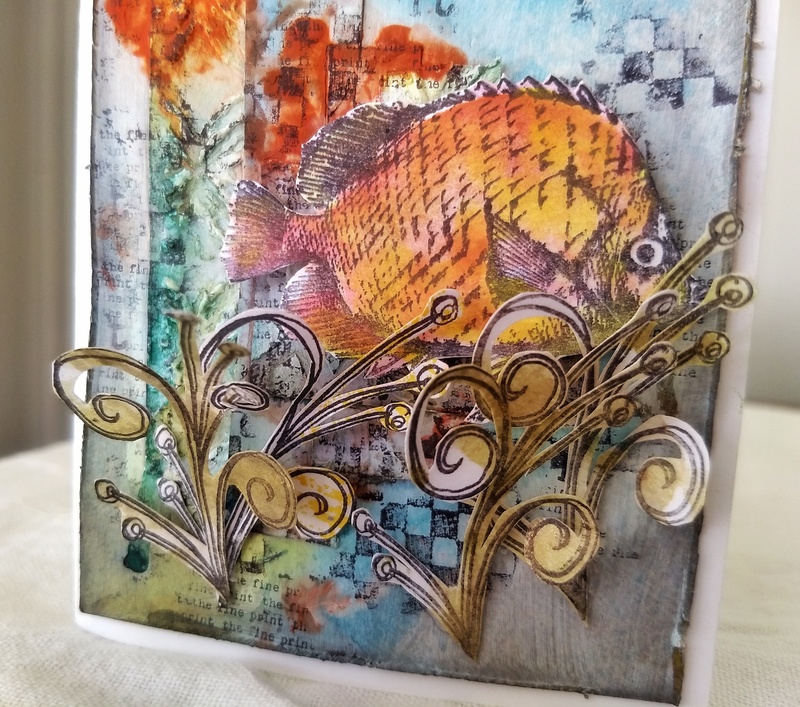 Beautiful card-love the fish! Wishing you lots of smiles ahead . Enjoy your tea stash, and happy T day! I was touched by your beautiful card, but even more by your wonderful words about creating memories. What a fabulous bargain you got at the Goodwill, too. A lovely post from your heart. It is good to have memories, they will last forever. Your card looked beautiful and the tea purchases look a real bargain of a find. Thank you for your moving post Kate, it’s so very true!! I was often in the same melancholy as I was in my 40ies – but now the hormons lead me to more peace in my heart and I just love to remember my lovely dead heart people in a very special and personal way- I am sure that the soul will be born again and that makes me so much more free of melancholy. 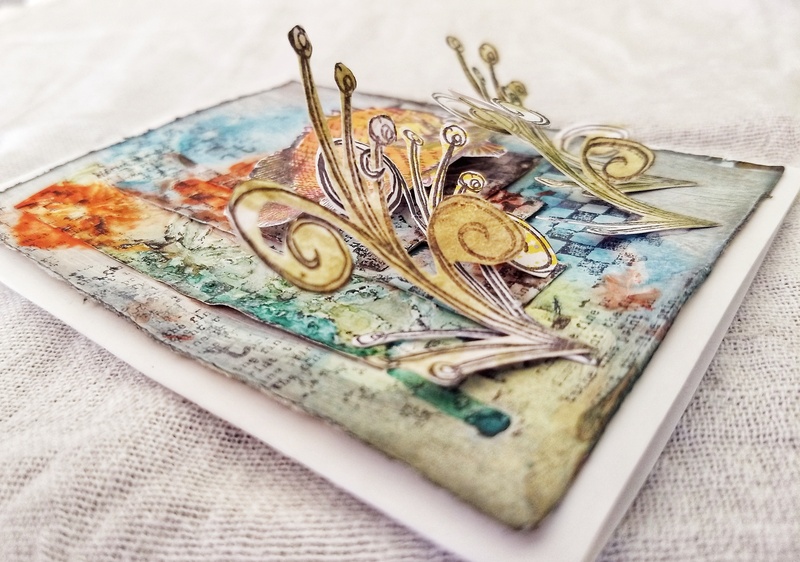 Your card is such a stunner,made of table scraps – amazing! The colours are exquisite, and those clever composition ist unique! 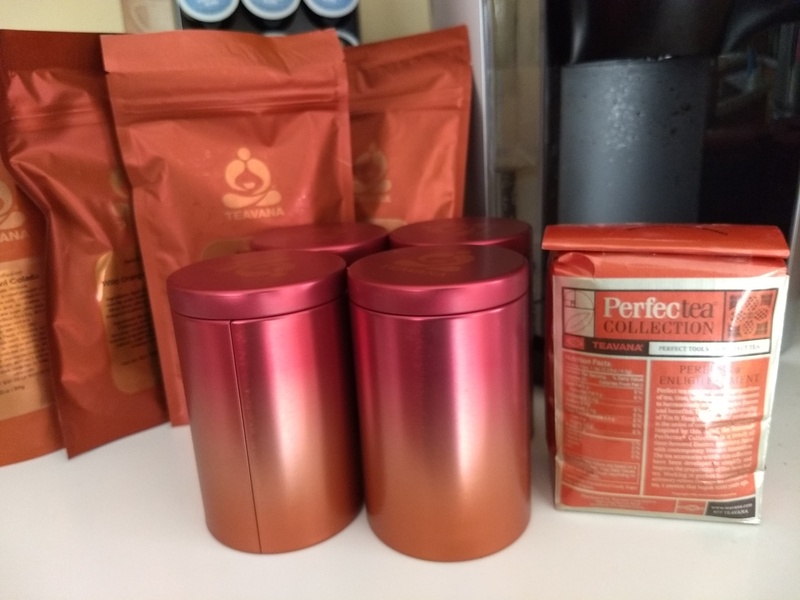 And wow-what a bargain for a Tea hoarder – well done! Happy belated T-Day! Such a lovely card and nice to read of your memories of your Grandfather. I just spent quite awhile on the phone with my adult granddaughter this morning. I hope her memories of me will stay long after I’m gone. Lovely card! I agree with you about the importance of making memories. Enjoy your Teavana tea! What a great find! I loved reading your post today. As I get older I miss the feeling of closeness family used to bring. Everyone is so busy and time is so precious people get lost in the shuffle 😦 Love your art this week too!!! Amazing card! Thanks for haring thoughts about your grandfather. I miss my mom so much. And a year ago tomorrow my best friend of 60 years died. We miss all the special people in our lives. But I feel we made a lot of great memories before they passed. Like you said, now I need to make memories with the children and grandchildren. Great tea find, too. Happy belated Tea Day! A truly beautiful post Kate. Thank you for sharing about your Grandfather. When memories are all we have left of the ones we love, even those memories that make us cry, can still be be so heartwarming. What a great post Kate! I went from feeling blue and crying to giggling out loud! You are good to pull all of that emotion from me, even after my coffee! You are very right about those connections,though and I am glad you put that out there as a reminder to us all! Thanks for sharing about your Grandpa, I am sure he was a lovely man! 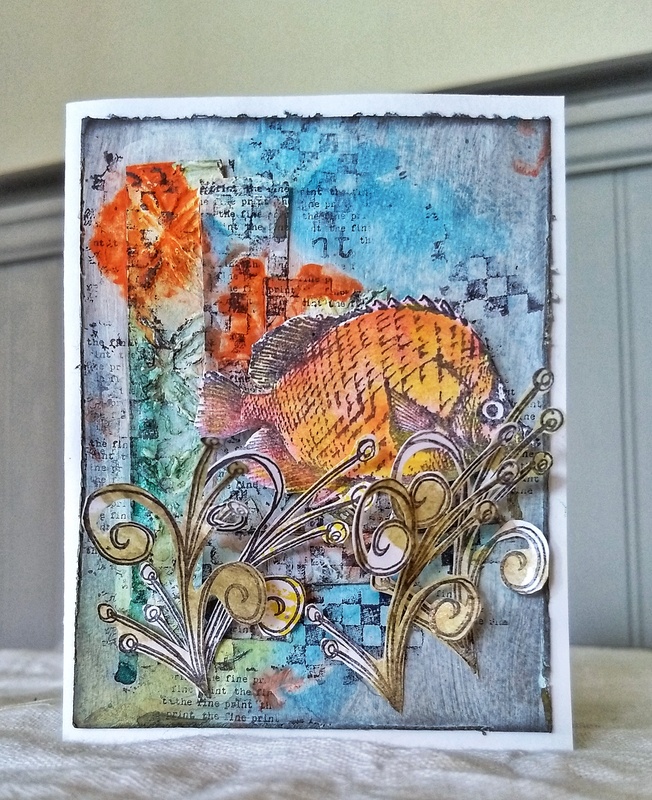 A stunning creation which I enjoyed swimming through looking at all that delicious detail and a wonderful post to go with it. Life is too short and we do need to cherish past memories but be adventurous and create new ones along our journey. Thank you for sharing with us over at That’s Crafty, it has been a real pleasure. Great post this morning, Kate, that speaks volumes! Yes, those day to day memories are those that stick. So good you are still remembering your Grandfather–he sounds like a wonderful influence in your life. Lucky you to have those memories. It’s funny who I think of that has passed who creates this emotion in me; not at all who one would expect–my neighbor. I still miss him so much! Your card is lovely, even though I do not like fish. The colors really speak to me. I hope you are enjoying a blessed Easter Day. Hugs!